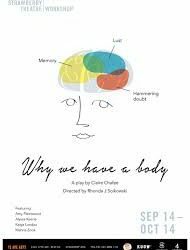 In producing Claire Chafee’s “Why We Have a Body”, the Strawberry Theatre Workshop has unearthed a sparkling gem of a show. The piece first appeared in San Francisco back in 1993 but speaks directly to audiences today. The play features four distinct women the audience may want to quickly pigeonhole into types. But the brilliant and often hilarious script continually has us redefine these characters as they build their own world independent of patriarchal expectations. Demanding material here, but the four women cast succeed on every level, enabling this one act to provide a stellar evening of thought provoking entertainment. The opening scenes provide snippets of four separate lives, as each character is first met individually. Eleanor (Amy Fleetwood) is the mother of two girls. She is now making her way through arduous hikes in Peru. Fleetwood captures the heartfelt concerns of a mother carving a new identity for herself. Reflecting on mothering her daughters, she claims to have “lifted them up and out.” They are on their own now, as is she. Lili’s favorite lesbian hero growing up was “Harriet the Spy.” Chafee maintains a focus on literary and historical women heroes throughout the work, also referencing Joan of Arc, Sylvia Plath and Virginia Woolf. Their words and works provide a cultural background for the characters. Mary, the younger daughter (a high energy Katya Landau) has chosen to live outside the law. We first meet her holding up a 7-11. She is battling some mental conflicts and will soon turn to her sister Lili for support. Meanwhile Lili is consumed with a woman she has met on an airplane trip, Renee. Renee (Mahria Zook) is married to a man but muses that she always wants to lead when she dances. She is a successful paleontologist and she proudly announces to her class and us that “We could be anything!” Her romance with Lili provides one of the key arcs of the play. Zook’s intense approach to her character helps amplify the excitement of a young woman coming out. She marvels what a delight it now is to notice all the women in her supermarket. Why We Have a Body runs through October 14 at the 12th Ave Arts, 1620 12th Ave on Capitol Hill. For more ticket information go to strawshop.org.